Obviously, there’s no real substitute to a laptop computer. 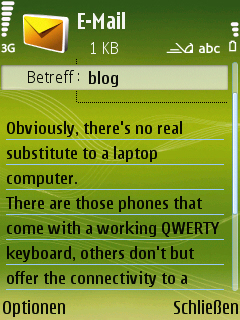 There are those phones that come with a working QWERTY keyboard, and others that do not but offer the connectivity to a bluetooth keyboard instead (such as the SU-8W). Such a phone with a way too small keyboardpad is my Nokia N95. “It’s what computers have become”, as Nokia advertises it. Only: you can get a full size laptop computer for the same amount you’d have to cough up for a Nokia N95. In other words: for an amount of around EUR 600,-, this phone has to be really good. But it isn’t. It primarily is a phone, and as such it does it’s job quite well. The interesting, multi-tasking operating system Symbian S60, 3rd (feature pack1) does a remarkable job, and it is while working with this phone that you realize how this little gadget actually works. Much like an iPhone, I suppose, that also offers an interesting GUI which takes time to load – and sometimes hangs itself up due to a system-hiccup. A reboot as the interim solution, or the flashing of the internal firmware does the job. Frankly said, with banana software that ripes with the customer and short product cycles, I never expected anything else but exactly this behaviour. Another drawback besides of the ever draining battery (this has improved over the time now and I’ve managed to keep it running on one battery charge with normal usage for something like 48 hours – which would include lots of SMS and listening to music) is the narrow keypad, which makes entering text a pain in the…fingers (the multimedia buttons, actually, not so much the 0-9, *# keypad). 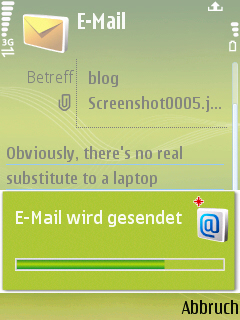 The delete (“C”) button on the lower right of the front buttons is just next to the so-called “multimedia button”, meaning that I sometimes accidentally hit the multimedia button, and I have to switch back to the draft folder within the SMS menue where the started sms was – fortunately – saved automatically. Also, the other multimedia buttons on top when you slide down the front part are just useless. I hardly ever use them! Now, those are the bad sides of the phone. And there have been numerous reviews on this phone during the past 2-3 months, a huge fan base around the world that diligently describes every new trouvaille, so nothing, really nothing is unmentioned. As for the Nokia N95 vs. the Apple iPhone – I am 100% d’accord with Steve Litchfield: the iPhone is 5 years ahead, but it lacks a LOT of features even average, mass-market phones such as the Nokia 6230i or the SonyEricsson W810i already have. Which gets us to the hightligts. I initially decided for this phone coz I started using the mp3 player that came shipped with my previous Nokia 6230i. The phone had been “pimped” with a 2GB multimedia memory card (MMC) and thus had some “issues”: a) indexing took ages whenever the player was started afresh (after rebooting, as the index list wasn’t saved for whatever reasons) and b) it sometimes just rebooted out of the blue. So the idea was born that I would need to invest into a new phone. I wanted to get a phone with a working mp3 player, a decent internet browsing facility (~ screen size) and, most importantly, a good camera. 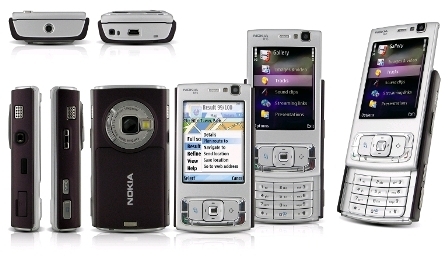 The Nokia N95 has all this! And this btw is also why I didn’t go for a Nokia E61i or the brand-new E90 communicator, both from Nokia (the E61i is very tempting indeed, only that it doesn’t have such a nice cam). The N95 DOES have a great cam (for a phone, that is! ), it has EVERY possible communication interface there is: USB, IR, Bluetooth, Wi-Fi, GPRS, EDGE, WCDMA (UMTS 3), HSDPA (3.5G), a reliable mp3 player that remembers where I stopped the last time, even after rebooting the phone in between (nice) and the ability to record videos in near DVD quality (with a mono microphone though, which is kinda sad compared to the stereo mic on the N93). So the point is: the N95 is a multimedia phone, and as such it does a great job. And then of course there’s the e-mailing thing. I know there are other phones that do this job much better, even those with a push client etc (Blackberry & Co.), but for my private & “always-on-the-road”-needs, the internal e-mail client just works. Heck, it even allows me to attach photos, video, audio files or other content! Well…I guess some of these HTC PDAs running on Windows Mobile 5.x /6.x aren’t bad either (i hear you, Aegeus :-) and I should give them a try next time. Oh, and btw: I didn’t pay anything for the phone so far, as I got it subsidized with two contracts – which are supposed to generate revenue for the network provider and pay up the subsidization. There’s a montly base fee, but apart from that, nothing else unless you use the two SIM cards. Well, I won’t. thank you for educating me on GPRS.amcurrently connected with safaricom on samsung E700,however the connectivity is very slow,could please advise me why. i also learnt that ican use bluetooth to browse on my comp,please advise on the model i can use and whether it can improve the speed. I don’t know about how you connect your Samsung phone to your computer, but I guess it’s a cable solution. If this works fine, you won’t need a bluetooth connection between your phone and the computer. I recommend that only for when the cable connection is too bugy or when the reception is better with a bluetooth solution (e.g. putting your mobile next to a window and hook it up to your machine via BT). You may want to check out the speed settings on your machine. Also, GPRS _IS_ sometimes slow, and it’s in the nature of this technology that the speed also depends on the amount of users who are simultaneously using the same base station for data transfer. That’s why it may be better during the night. Let’s wait for the WCDMA (3G) network in Kenya which is said to be ready by the end of 2007.